For parents and babies that want more from a nifty set of wheels than a simple stroller, the compact foldable SmarTfold is a covetable must-have. Transforming from stroller to trike in just a couple of clicks, the SmarTfold grows with your baby and makes getting out and about lots of fun. SmarTrike’s smarTfold revolutionary foldable trike is designed for babies from 6 months and is built to grow with your child. It’s crafted to fold and stow easily and can be assembled without any tools, making it a perfect ready-to-go gift. Its compact size means that it can be popped in the car or tucked out of sight with a minimum of fuss and is no bother to take on holidays too. SmarTfold’s not all about fun and form – it focuses on function too. The trike’s unique patented Touch Steering system means it’s easy to push and moves just like a top-of-the-line stroller. A handy navigator button allows parents to switch from Touch Steering to child ride-control and shock absorbers ensure your child has a fun and comfortable ride. This innovative and practical trike boasts a padded seat, overhead canopy, storage bags and accessory tray, combining what parents need – and what kids want – seamlessly. Stage 1: A compactly folded trike – it takes up 85 percent less space when folded and opens easily. Stage 2: The seat swivels 180 degrees and reclines – lets baby lie back in comfort – facing the parent. Stages 3-6: From 9 months baby can safely use either the early stage footrest or, at a later stage, the fold-out footrest. 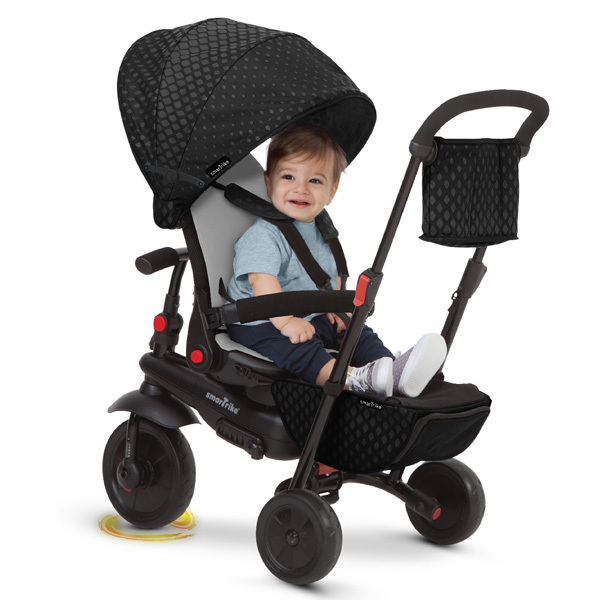 With the high-back support and UV expandable canopy, baby will enjoy the ride while developing confidence, balance and motor skills. Parent controlled. Stages 7: From 24 months the Folding Trike transforms into a training trike. It helps toddlers learn to pedal while parent navigates. Stage 8: Telescope handle closed, trike converts into a classic tricycle that kids pedal independently. This state-of-the-art smarTfold, loaded with features, is set to take the world by storm! The SmarTrike SmarTfold 400, 500 and 700 models are available at Toys R Us, Big W, Target and Baby Bunting and start from $199.99. We think it’s the perfect gift for adventurous, on-the-go families.